"The Wakefield Town Hall, dedicated on February 22, 1871, was the result of a community's desire to honor its citizens who answered the call to arms during the Civil War. Four years earlier, in 1867, a Soldiers Monument Association was formed to build a suitable monument or hall for that purpose. In January, 1868, the association reported to Town Meeting that Cyrus Wakefield had offered to donate a parcel of land, known as the Noah Smith lot, on Main Street at Water Street for the new Town Hall which would house an appropriate soldiers' memorial. In addition, he also pledged a sum of $30,000 or more, to build the structure which would also have a lecture hall for town meetings, and a room for the town's library. Solon Richardson also pledged $1,000 for furnishings. As a result of Cyrus Wakefield's generosity, the Town of South Reading became the Town of Wakefield in 1868. The Town Hall remained a vital part of Wakefield until a fire occurred on December 13, 1950. Some offices located in the structure were moved to the present day Town Hall, then the Lafayette Building, where they were to be temporarily located. Committees, Town Meeting voters, and Town officials discussed the renovation, as well as the razing of the structure which was still intact. 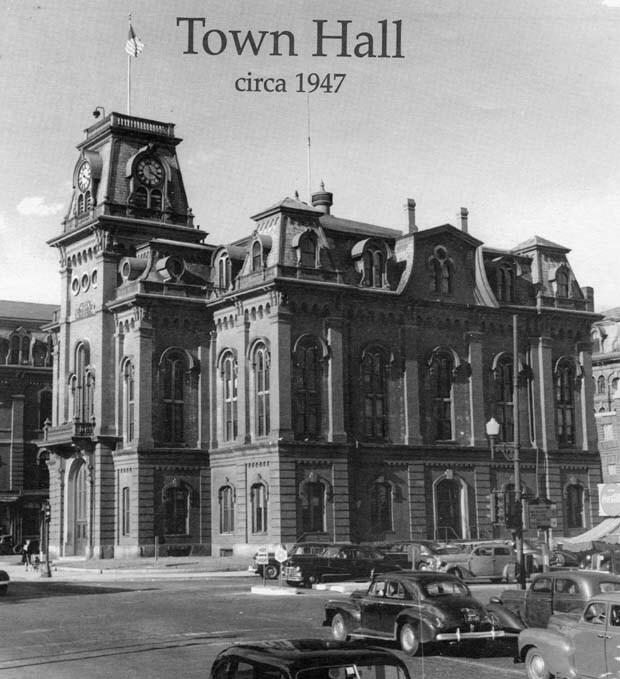 Town Meeting accepted the recommendation to raze the Town Hall in March, 1958. At the same time, the Parking Committee recommended the site for use as a parking lot. The stately Town Hall was razed on October 20, 1958." -- Text from calendar by Jayne M. D'Onofrio. Photo courtesy of Alfred Mellett. “Town Hall, circa 1947,” NOBLE Digital Heritage, accessed April 22, 2019, https://digitalheritage.noblenet.org/noble/items/show/7103.